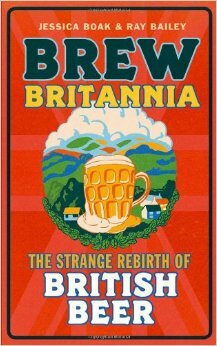 Brew Britannia (Aurum Press, Paperback, $19.99, 298 pp) charts the course of the tumultuous changes in the English beer scene. Jessica Boak and Ray Bailey, the voices behind a popular blog, tell a very engaging tale of “the strange rebirth of British Beer.” While very similar in structure to the American renaissance, the twists and turns in Great Britain, and the personalities that populate that history, reveal a distinctly different beer culture. Unlike the American transformation led by the emergence of new breweries, the British drive for good beer began in the preservation movement. Saving cask ale from extinction was the cry and under the direction of the Campaign for Real Ale (CAMRA) the vehicle for a groundswell of support from the public. Touted as one of the most successful consumer movements, CAMRA stemmed the decline of cask ale, turning it completely around. With success and time, CAMRA came under fire as driven by old-timers. Furthermore, the tidal wave of new breweries and imports from Belgium and America fostered the creation of a much more complex beer market. With the explosion of excitement surrounding hop varieties, experimentation with novel ingredients and revival of lost styles, beer had become hip and no longer just cask ale. The market moved away from exclusively embracing Victorian pubs with multiple handpumps to a more eclectic mix of presentation styles. After reading this book, the shelves in your favorite bottle shop—brimming with British imports—will have a gravitas only a good story can give them.